Counting scales with easy to read digital displays are rugged, dependable and ideal for accurate inventory management, warehouses, & parts with small unit weights. Improve your bottom line and make your counting more efficient with our easy to use counting scales. When accuracy counts, you can count on us to provide you with a complete line of inventory parts counting and coin counting scales for you to buy. Portable, efficient and accurate, our electronic piece counters are ideal for anywhere an exact count is required. Our systems allow you to know what you have in inventory, resulting in much better manufacturing efficiency. Professional quality digital systems from Pennsylvania, GSE, Avery Weigh-Tronix, Ohaus and Digi are available. Quite a few of our products are battery powered and for the most part they are in stock and priced right. Call or email us for a quote and honest product reviews since we deal with these on a daily basis and know what customers like about certain digital parts counters. Manufacturing plants use our counting scales to count the number of screws, bolts, washers etc. that go into bins. Others use these for company wide inventory management. Vending companies use our coin counters to count the money retrieved from their machines. 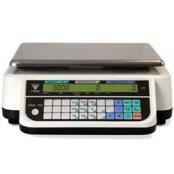 Odds are your business can probably benefit from one of our affordable digital counters. Most of these industrial scales include easy to follow instructions and memory functions for storing commonly counted items. 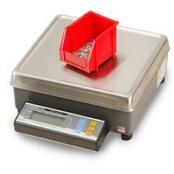 Need to weigh and count larger amounts? A remote base can be connected allowing you to count and weigh amounts over 5000 pounds. Computer connectivity and label or receipt printing are also available on some models. Adding one of our digital scales to your warehouse can help you simplify your inventory management process and ultimately improve your company efficiency and productivity. Counting Scales - ProgrammableProgrammable counting scales offer advanced features like Network Fieldbus Modules which provide open architecture connectivity. An Ethernet Module allows for communication across an intranet or internet connection supporting DHCP servers or fixed IP addresses. Counting Scales - IndustrialIndustrial counting scales typically means that the item is built tough to handle the work load that a warehouse might throw at it. A good example is the Pennsylvania 7600 series or the A&D FC-i series. Counting Scales - PortableWhen you purchase a portable counting scale, it allows you to take your digital counting scale with you around the warehouse. Built-in rechargeable battery packs in counting scales can sometimes provide up to 200 hours of continuous use. Coin Counting ScalesEasily count quarters, dimes, nickels and more with a digital coin counting scale. It doesn't matter if you own a coin laundry or a video game center, you need a fast and efficient way to count your change at the end of each business day. Who wants to count all those quarters out by hand? Counting Scales - Buyers GuideDigital Counting scales look at the weight of the items you place on the weighing platform and divide the weight by the number of pieces you entered, to compute the average piece weight (APW). When it comes to counting parts on your shelf you need a counting scale for increased accuracy and to reduce human error but the scale you choose needs to be easy to use or you will once again introduce human error into the mix. 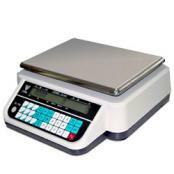 Our selection of easy-to-use and highly-accurate digital counting scales provide convenience and reliability to the inventory process. 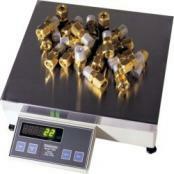 Our weighing equipment is ideal for weighing small pieces. We offer a variety of capacities and features. Popular capacities typically range from around two pounds up to one hundred pounds. Most of the devices include a RS-232 serial port standard for printer connectivity. If you're looking for portability be sure to ask for a model with rechargeable battery pack. 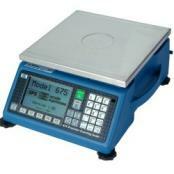 Certain models can also be connected to remote scales and other peripherals for greater weighing capacity. And of course as always give us a call and get our opinion on what scale you need. We provide honest feedback and product reviews and often assist customers to choose the best solution for their needs. In many of our items you can have both 110VAC and battery power. Many customers place their scale on a table or desk and count parts all day long. Meanwhile other customers put their digital parts counter on a rolling cart with wheels and roll it up and down aisles throughout the warehouse. Either way we have the scales that will work great for you in either application. Talk to your sales associate and describe how you plan to use the scale. In the majority of cases our devices above either include a battery or have an optional battery available. We also have label printers available for select products which allow you to print out the amount of parts that you've counted and place the label on the side of the box. We've been using and recommending these items for decades, give us a call at (919) 776-7737 for advice and insight into what product will provide you the best value for the money. 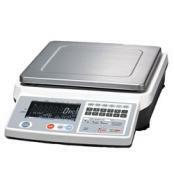 We offer almost all the top brands in the scale industry.